Photos 3, part of macOS High Sierra, doesn’t bring much that’s truly new. Apple acknowledges this by listing changes as a combination of improvements and enhancements, a welcome bit of frankness. And I’d argue it’s great news, because many of the rough spots in the Sierra release that we heard about repeatedly from readers who ran afoul of them have been smoothed down. But Photos has come a long way since its first release in April 2015. That initial foray at replacing iPhoto with something fresher, faster, and better often fell short, because it was missing many features that people relied on with iPhoto. Apple released regular updates, however, and features returned, new ones appeared, and existing ones matured. Some people still hate it—I get emails—but it settled down for the most part. For example, those who have emailed me asking how to force an alphabetical listing of albums in the Photos sidebar will be absolutely delighted. The sidebar now organizes albums into Media Types (things like Slo-Mo, Selfies, and the like) and My Albums, which comprises everything you’ve created. You can nest folders in My Albums as before. Right-click on My Albums, and you can choose Sort By, and select among name, oldest first, or newest first. Bonus: Any of those nested folders you create to organize albums can also be sorted separately by those criteria through a similar right-click. The general Photos interface is more legible, has better differentiation of features, and in its persistent sidebar organizes features and albums better, too. Let’s dig deeper into how Photos has changed. 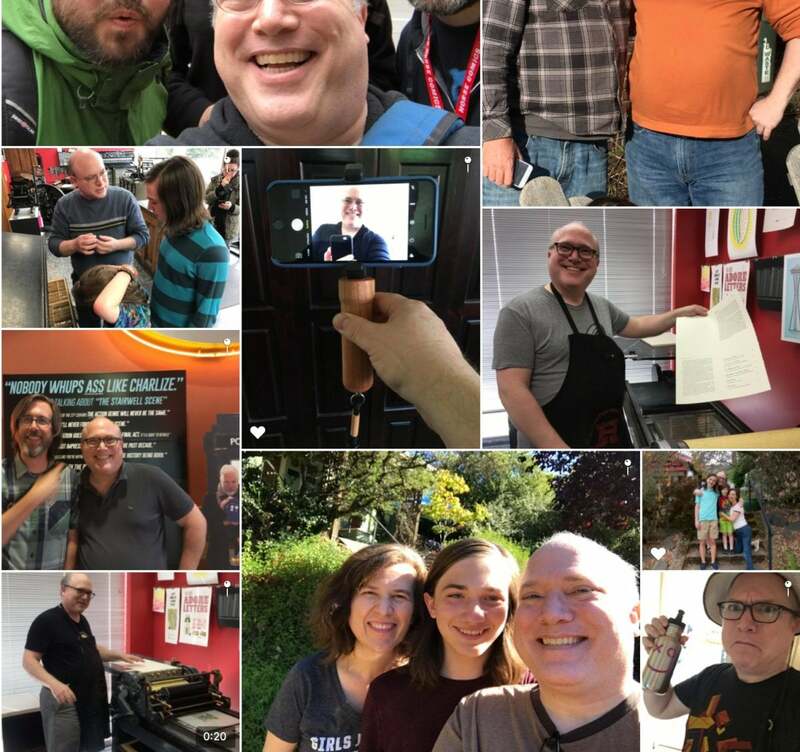 Introduced last year, Photos’ Memories feature collects photos around a location, a time or holiday, or a theme determined in part by machine learning, which also then highlights the photos in that assembled set that it thinks are most representative. Let’s just say it could be fairly haphazard in the previous version, producing some howlers in terms of odd photos chosen—sometimes blurry or nearly empty—and not quite getting what might have made that period significant. The improved Memories feature shows what seems to be a better selection of photos, probably by working harder to find common sets of faces and perform sentiment analysis to find smiles and people looking at the camera. On average, they seem less bizarre, and less like a rogue robot assembled them. Photos 3 shows every previous import operation, organized by date. And Apple has clearly seeded smart ideas into the mix. Fluffy Friends over the Years shows every dog and cat I’ve apparently ever photographed, using the scene analysis algorithms that also let you search by keywords like dog and cat. The slideshows that you can run from Memories, which are automatically assembled from photos and videos, remain delightful random. One created for “Glenn’s 32nd Birthday”—hey, macOS knows my birthday via Contacts, so it can figure this out—features loving pans across the back trunk and odometer of a car I once owned. This feature remains far better in iOS, as it was in the previous versions of both operating systems, because iOS lets you play a slideshow as if it were a movie, and adjust settings for how long you want it to be and pick among music named by mood. In macOS, you press the Play Slideshow version, which brings up a set of prefab slideshow styles, most of which are not that great and are paired with annoying music. I confess I never much liked Live Photos, because there wasn’t much you could do with them, except play them back with the random before/after videos. (iOS 11 seems to have upped the frame rate on those, making them smoother.) Live Photos seemed like a clever idea in search of a reason. While Apple improved some aspects of Live Photos in iOS 10, such as adding image stabilization, they remained a Harry Potterish gimmick. Photos 3 finally lets you create new kinds of results—not just in iOS (where the feature is somewhat hidden), but in macOS as well. 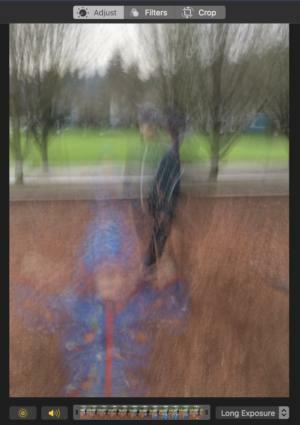 Live Photos can be transformed into loops, bounces, and long exposures. Click Edit with a Live Photo selected, and the Adjust tab of the editing window shows Live Photos-specific tools at the bottom. You can turn the feature off, as before, and mute its audio, but you can also select a new “key photo,” or the image displayed when the photo is at rest. And you can trim out unwanted parts of the clip. But Apple added transformative features common in Instagram and other photo apps: Loop, which turns a subset of the live portion into a continuous cycle; and Bounce, loops in a sequence of forward to the end and then backwards to the beginning. Unfortunately, you can’t select which portion gets these effects—it seems like an algorithm-driven choice. And you can’t (yet) convert your regular videos in full or as clips to apply these features to. A final option, Long Exposure, has a lot of promise. With a still shot that has movement within the frame, you can get a lovely artistic image that captures the feel of movement. Looking through all my Live Photos, I didn’t find many that worked, but I will likely now enable Live Photos for specific shots that I want to extract as long exposures. The whole editing interface offers significant UI improvements, too, grouping tasks into tabs at the top (Adjust, Filters, and Crop) and letting you turn on and off the depth effect in two-camera photos. A couple of more advanced features appear in the Adjust menu, too: curves, for a different and richer way to re-map the appearance of ranges of color in an image; and selective color, which you can use to swap out a specific color range in an image with an entirely different hue, saturation, and luminance. 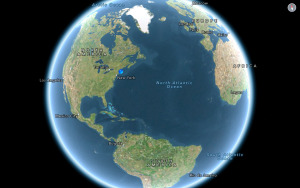 A toolbar now appears in all Photos views, not just edited, that includes a rotation button (hold down Option to toggle it from counterclockwise to clockwise) and Auto Enhance. Photos also now supports editing images in external photo-editing apps by selecting from an Edit With menu. When saved and closed from that external app, those edits become stored as a non-destructive layer in Photos, so you have the original and the revised version. 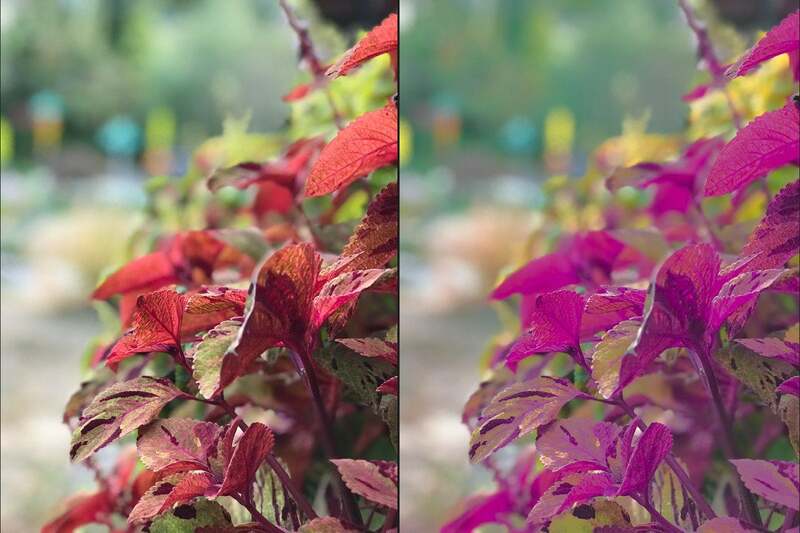 Selective color, now built into Photos, lets you replace color families within a photo without making other changes (left, original; right, modified to accentuate changes). Apple promised a year ago, before the release of its revamped facial-identification feature, that “People are synced among devices where you’re signed in with the same Apple ID.” That line appeared in the iOS 10 manual, and the company had made other assurances. It never happened, and Apple never answered questions about it or explained itself. My assumption was that before release, Apple found a flaw either in the way they merged dissimilar sets of people on different devices or in the privacy approach it took. You’ll note that Apple didn’t and still doesn’t sync this new algorithm-based People album to iCloud.com. That would put that kind of information in a place where it was at greater risk of being extracted or even subpoenaed. This time around, Apple got whatever right they needed to. People’s overall design has a crisper, bolder look, so that names are more easily readable. The process of identifying and marking people seems better. And Apple says that it’s using technology from Memories to recognize people together, which provides more accurate ID and facial-expression selection—see my screen capture from People’s assemblage of photos of me!—but also offers links to groups and pairs of people found in the same photo, a nice addition. I found that my previous People album recognition carried through with the update, but some images were added that I’m sure I didn’t select. You can just right-click on a photo and select John Doe Is Not in This Photo, and it’s removed. Apple says that iCloud sync will reconcile different sets of photos for the same people on different devices. The improved Memories feature now works within People, too, and you can see how good it is about finding smiles and other extreme expressions. 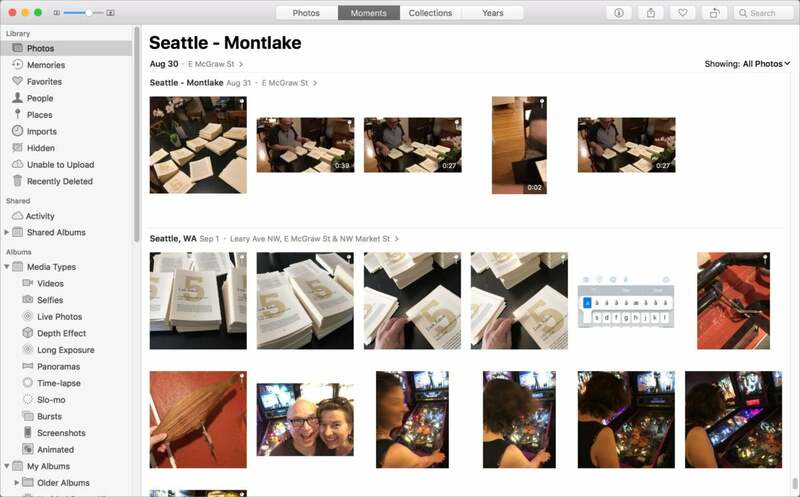 Apple now lets third parties build associated extensions that work with Photos. Previously, only photo filters could be added on. This new category works for creating photo books, ordering framed prints, creating slideshows, and building websites. Apple’s options for cards, calendars, books, slideshows, and prints remain. These extensions come in the form of apps you purchase or obtain for free through the Mac App Store. You have to launch the app before using it, and then (in my testing at least) relaunch Photos for the apps to then appear as options in the Project menu or in the contextual menu’s Create submenu. Apple sent a variety of samples of products made by these companies to Macworld. Mpix foil-pressed cards are vivid and quite lovely, although they may be a little too busy with patterns for some people. An Mpix wood-print deep photo box for hanging had a good reproduction of a photo printed on wood on its front. Shutterfly’s 10-by-10-inch hardcover book had well-reproduced color photos, although somewhat oversaturated. The pages were too stiff, however, and turning them was like flipping through lightweight cardboard. Mimeo’s 9-by-11-1/2-inch hardcover photo book felt completely book-like: a good dust jacker and binding, reasonable weight interior paper for opacity and page turning, and extremely fine photographic reproduction. An ifolor glass print, in which the image is printed in reverse on the back of a solid piece of glass—a technique popularized in American by Fracture—had oversaturated images, leading to areas of flat color. Two examples of Whitewall’s glass prints were also included, which had excellent tonality without oversaturation. The photos sent were unfortunately too dark to see clearly how well lighter tones are reproduced, but the differentiation in shades for shadows and dark colors was extremely fine. 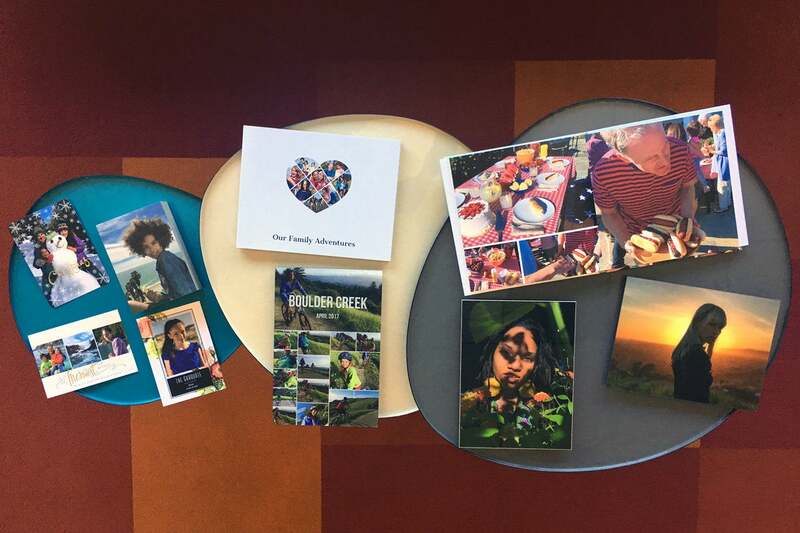 Photos' Project Extensions allow you to create photo books, cards, mounted pictures, and more directly in the Photos app. Photos ability to search by date remains extremely poor, especially compared to Google Photos and other tools. There’s simply no good way to say, “Show me what happened on October 31, 2010.” You can use the main Photos album and click Years in the new set of tab buttons the top, scroll to 2010, guess about where October lies, click, and then scroll through Collections. Typing in the date as above into search offers no results. It can’t even do “October 31,” splitting it into “October” and “31” and only finding matches for both. The new version does seem to match address well: I typed in September 1, and saw a lot of photos taken in the month of September at street addresses that began with 1. Likewise, searching by place is primitive. Enter “Camden, Maine” and Photos is stumped. Enter “Camden Maine” and it parses it to show “Camden, Maine/City, State.” I can’t even begin to explain how Apple passed this through its testing teams. Search performance is far better than iPhoto and early Photos releases, but it remains as poor and wonky as all the Sierra versions of Photos. If you’re using iCloud Photo Library and storing only optimized media on your Mac, you won’t be able to make full use of facial recognition, Memories, or scene-element identification for searching except for images downloaded and cached locally. You can also force downloads for processing by right-clicking a manually created album and choosing Download Originals to This Mac. While this proviso was also true with the previous release of Photos, I think an increasing number of people relying on iCloud Photo Library might run into the problem because of increased media storage and the high expense of larger-capacity SSDs. If you chose a 512GB SSD instead of a much-more expensive 1TB SSD or a 1TB or 2TB Fusion drive, it seems possible that you also used optimization to prevent filling that drive with media. In my initial High Sierra testing, I’ve only updated my laptop, which lacks the storage to handle the full iCloud Photo Library. (My office iMac has a Fusion drive and the full files, but I’m holding back on my most critical machine as I do with all macOS system updates.) I downloaded albums to check that thumbnails weren’t being analyzed. 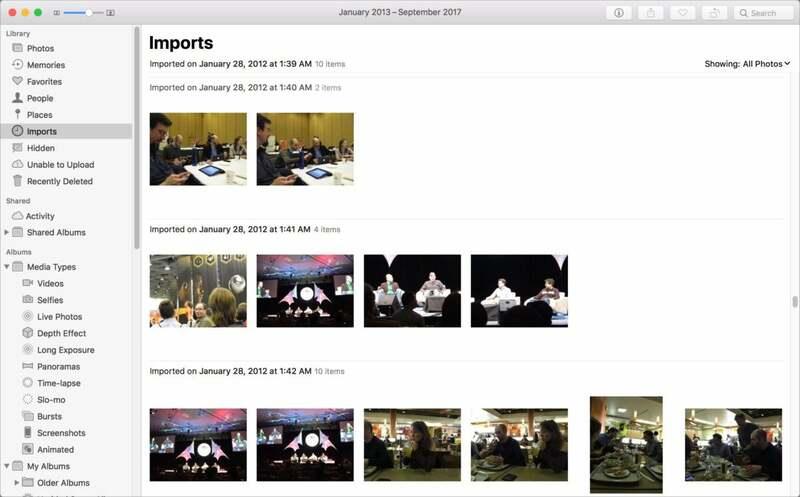 iCloud Photo Library syncs metadata—camera capture details, date, GPS coordinations, keywords, and the like—so other searches and organizational features work as expected. Photos 3 for macOS is a significant improvement in interface, flow, and ease of use, but has no standout feature that will make you jump up and down in joy. Hopefully, the changes mean won’t jump up and down in anger and frustration anymore.